Just recently, we saw Australian almond producers make claims that were rather surprising for the industry and many who take a keen interest in almond production. After going through a period of stability and very little growth, producers of almonds based in Australia are have been claiming to be experiencing tremendous growth. Contrary to previous industry comments, many speakers at the Australian Almond Conference have stated that this growth has not been overestimated. According to an analyst within the market, Vernon Crowder, the growth here in Australia has been phenomenal and is set to become even better in the years ahead. By the year 2020, 83% of the almonds produced will come from California but this is something that has been occurring for a very long time. However, Australia will be in second place supplying around 8.5% – an increase from just under 7%. Although it won’t have a huge impact on the market itself, Australian producers are now seeing record prices partly thanks to the shortage in production in California. For a long time, Spain was second in the list of producers but Australia has leapfrogged them due to significant plantings of Olam and Select Harvest in the Riverina coming into commercial production. In terms of consumption, the market in Australia has grown significantly over the past decade and now sits as one of the highest in the world when it comes to ‘per capita consumption’. Although there are many reasons why, one of the largest seems to be the availability of information nowadays. As we learn more about what ingredients can do for us and how we can stay healthy, more people are seeing the health benefits of almonds as well as various products that contain the nut. Although almond milk has been growing in popularity of late, this is not thought to be the reason behind the rise as a litre of almond milk only contains one almond. Furthermore, there is more good news for almond producers as experts believe that they have found the secret to increasing pollination – hive protein supplements. 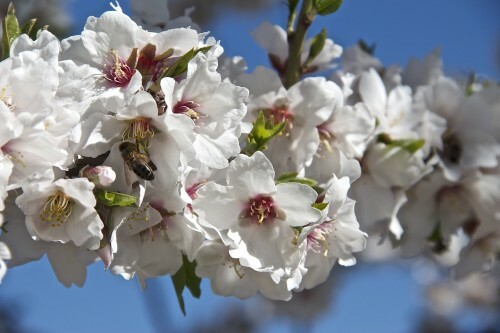 For beekeepers, pollinating almond orchards is a huge role and so research was carried out to find a way of improving the health of honeybees. Essentially, there are three different roles within a hive. As well as the baby bees, there are the ‘nurse’ bees that look after the babies and the foraging worker bees. When in the hive, the babies give off a pheromone that suggests that it needs feeding. As a result, the foraging bee will head out and collect pollen. If there is no brood in the hive, the demand for pollen drops. Therefore, this additional protein allows bees to live longer and they become more effective as a colony and the foraging bees pollinate more frequently. In recent years, we have seen the demise of the honeybee as their lifespan has reduced. As carbon dioxide levels increase, pollen is losing its nutritious value too so this is the beginning of an overall effort to save the bee colonies and allow them to become as efficient as they once were. In addition to this added protein supplement, researchers are also looking for ways to tackle the ever-growing varroa mite issue.